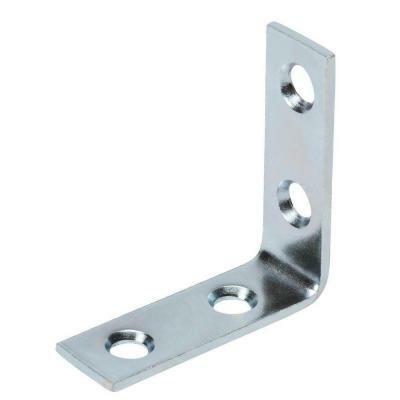 In many instances I have used metal L-brackets to fix broken cabinets with metal brackets. They work very well for drawer repair and if a cupboard is coming apart. Sometimes where there’s water damage and the case of the box is separating on the finished side of the cabinet, an L-bracket can be installed on the inside to hold the bottom of the cabinetry to the side. This usually doesn’t work very well if there are drawers on the area where the separation is occurring. When countertops come loose, metal L-brackets work great for fastening the top the cabinet again. This is a very safe way for the homeowner to fix a loose top. This will save you from making a hazardous mistake and running a screw up through the countertop. If you are doing your own cabinet installation and have ordered the boxes prefabricated, sometimes the joints are not very strong. When you are moving the boxes around it’s possible for the side to separate from the top or bottom. Installing L-brackets to repair the damage works great. If you have a dishwasher end panel that is supporting the countertop and it is loose at the floor, installing an L-bracket will secure the loose part. The chances are good that you will need to use a hammer drill for drilling the pilot hole in the tile or concrete floor for the fastener. We would normally use Tapcon screws for this task. We have also used them in areas where there is an extra deep refrigerator panel that needs to be secured to the floor as well. Obviously you would use the same method that you use for a dishwasher panel that is loose. It goes without saying that you will need to remove the dishwasher or refrigerator in order to secure the metal L-bracket to the floor and panel in either instance. This may require hiring a plumber if you do not know how to disconnect the dishwasher. Tip: Always be careful to not use screws that are too long. Sometimes the screws provided with the metal fasteners are not going to work for the application. You will need to take a trip to the hardware store if you don’t have any screws that are short enough. L-brackets can be used in every area where the cabinet parts are separating. The metal fasteners are great items to use when repairing kitchen, office or bathroom vanity cabinetry. They will secure drawer parts, cabinet sides and bottoms, dishwasher panels and countertops that are loose. Steal L-brackets are one of the first things I consider using when I am doing any type of cabinetry repair. Drill pilot holes in the edge, so the board won’t split, and drill them to the depth the screw will be inserted, plus about. From deck fasteners meant for building a backyard patio to the products needed to hold a sky scraper together, the construction industry needs all kinds of bolts, screws, and clips. The barn is wood framed with vinyl siding, and the Trendnet was placed in a rear corner. Thermal binding has been the perfect solution for customers looking for a quick, securely bound document. The primary fasteners normally fix the isolation panels while the side ones connect the isolation panels. Gamelan elements are used in this film to punctuate several exciting fight scenes, as well as to symbolize the emerging psychic powers of the tragic hero, Tetsuo.